We are also producing a biodiversity exhibit at The Winter Fancy Food Show, so please stop by to say hello. 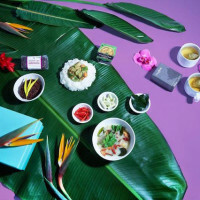 Below, I speak with Thrive Market co-Founder and CEO Nick Green about how the retailer is promoting biodiversity by prioritizing supply chain partners that farm regeneratively or biodynamically. Green encourages brands to prioritize Demeter Biodynamic Certification and Regenerative Organic Certifications, as he predicts they will become more prevalent in the next 18 months. He also talks about how he’d like to see more products that focus on soil health, both on the meat and meatless side. DG: Is biodiversity a priority for Thrive Market? If so, how and why? Nick Green: Yes! Biodiversity is one of the key tools for ecosystem health and longevity. At Thrive Market, whenever possible we prioritize supply chain partners that share this view, partners that consider how their practices will affect soil health, water quality and surrounding plant and animal life. More and more that means supporting producers who are farming not just organically, but regeneratively or biodynamically. 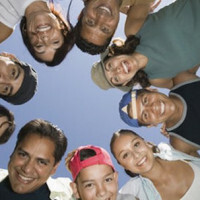 DG: How does Thrive Market define and think about biodiversity? What does an ideal biodiverse food system look like? NG: Biodiversity is a broad term but, at Thrive Market, we focus primarily on the importance of a place-appropriate abundance of plants, insects and animals to achieve a balanced soil and water system. The “good” level will depend entirely on place, but the primary measure we use is when minimal inputs external to the system are needed to maintain nutrient levels in the soil. DG: What is Thrive Market doing or planning to do to promote biodiversity? NG: As a retailer and maker of our own products, we promote biodiverse practices whenever possible by choosing to sell or source from partners farming regeneratively or biodynamically. For example, our pork partner in Georgia has long been a Savory Institute Hub, a teaching ground for regenerative agriculture, and was recently announced as one of the first farms to be included in the Regenerative Organic Certification (ROC) pilot. Soon we’ll even be launching a regeneratively-farmed popcorn! NG: Put simply, even if a farmer is producing a product organically, that product may not be around in 20 years if the health of its broader ecosystem is ignored. This is why practices like crop rotation, promotion of symbiotic plant systems (often in the form of “weeds” that return or capture nutrients for the soil) and use of animals to naturally fertilize and graze in moderation are so important. Practices like this not only make sense because they improve the long-term viability of the food system, but, done correctly, they can actually save the producer money by using inputs found internally in the system, rather than expensive soil supplements and fertilizers. Lastly, there’s a business case because more and more shopper want to buy products that are adding back to, rather than depleting, the food system. NG: Moving towards a more biodiverse food systems requires real risk and investment for producers. Consider the farmer who wants to transition away from the highly efficient, highly mechanized monoculture planting of corn. If they’ve been planting that crop for years, the thought of rotational planting might have long-term appeal but still presents massive tradeoffs in near-term revenue and business predictability. This is why it’s so crucial that consumers become more educated about how their food products are being made, so that the collective demand presents real financial opportunity for a better supply chain. NG: By far the greatest challenge is finding biodiverse supply chains that are both affordable for consumers and available in a large enough quantity to reliably be offered to our members. NG: We’re excited because, yes, more and more we’re seeing stronger demand for products that promote healthy soil through biodiversity. One of the huge advantages that we have as an online retailer is that we’re able to create content for our membership community that they can then share with other members or non-members alike. Whether this is educational content about how healthy soil can help sequester more carbon from the atmosphere, or sourcing mini-documentaries about partners transitioning to regenerative practices, we see the Thrive Market platform as an important voice in support of a move towards a more biodiverse food system. NG: Learn about soil health via resources like Regenerative Organic or the Savory Institute. Learn about biodynamic farming via Demeter. Look for those certifications to become more prevalent in the next 18 months. And support food systems that are aligned with the practices above! NG: More and more, we think the Demeter Biodynamic Certification and Regenerative Organic Certifications will become important to consumers. NG: On the meat and meatless side of things, we’d love to see more focus on soil health. This means multi-species rotational animal systems that move animals according to what the soil can support or actively needs, and plant-based or vegan options that are sourcing ingredients from low or no-tillage supply chains. NG: Our vision is for biodiversity, ecosystem health, regenerative farming, Biodynamic practices — for all of these to be household phrases in 10 years — sooner we hope, so that enough demand will exist from consumers to reward the transition for farmers, CPG companies, and retailers alike. 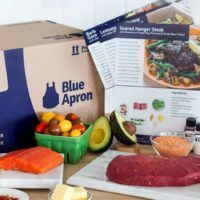 NG: Thank you to readers and to Food + Tech Connect and The Future Market for helping get the word out about this! 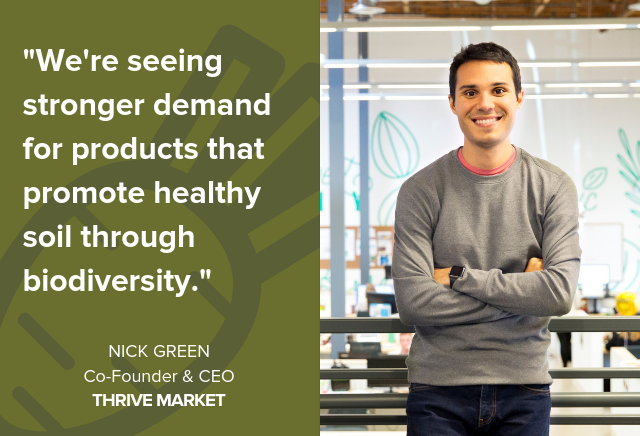 Nick is the co-founder and CEO of Thrive Market, the online membership platform on a mission to make healthy living easy and affordable for every American family. For $5/month, Thrive Market members get access to the top natural and organic products at wholesale prices shipped anywhere in the U.S. for free. A serial social impact entrepreneur, Nick began in the education space with his first business Ivy Insiders, a college test prep and mentorship program that made tutoring more affordable and helped over 20,000 students get into better colleges. More recently, Nick and his Thrive Market co-founders launched Alliance for Good, a philanthropic community that they seeded with $13 million to fund charitable work and social enterprise. Outside of work, Nick loves traveling, investing, reading biographies, and spending time with his wife and 1-year old daughter. He originally hails from Minneapolis, MN and earned his B.A. in Economics from Harvard.